The application for the bivariate descriptive statistics (2Var app) can be used to analyzed in a simple way correlations between two data sets. 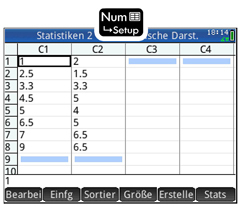 In the Num -view the characteristics of two features are entered in the columns C1 and C2. 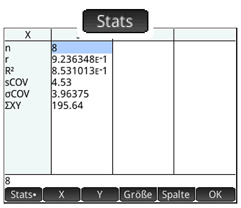 After touching the Stats key statistical indicators including the number of data, covariance, correlation coefficient or coefficient of determination are shown. 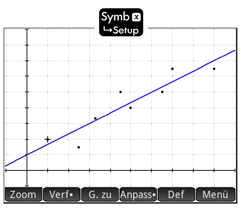 In the Sym -view the desired regression model can be selected (linear, quadratic, cubic, exponential, logarithmic, etc.) and the corresponding function term can be displayed. 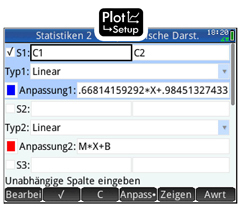 In the Plot -view the data points and the selected regression graph are illustrated.